Wes Fogden has revealed his Pompey heartbreak. And the popular midfielder paid tribute to supporters he has been forced to leave behind at Fratton Park. The 27-year-old was a shock presence on Paul Cook’s list of nine players who were released from the Blues. Despite the club having the option to extend his existing deal by another 12 months, the new boss declined. It has left Fogden looking to play elsewhere following 28 matches and two goals during an injury-hampered spell. The ex-Bournemouth man insists he learnt of his fate after instructing his agent to ring Cook on Saturday. Regardless, he is adamant he bears no grudges. Instead, he wishes the Blues the very best – as well as the fans he bonded with during a one-and-a-half year stay at the club. He said: ‘It would have been great to come on in the last game of the season against York in front of our fans. ‘Gary Waddock had only used two substitutes as well. ‘I’d liked to have said a big thank you to supporters for what could well have been my last game with my contract running out. It would have meant a lot. ‘One of the main reasons I left Bournemouth was for the fans, who then gave me everything. They were fantastic. ‘Hopefully they could see I gave them everything as well. I’m just sorry I couldn’t play more. ‘To be honest, my exit wasn’t dealt with that great. ‘I was in the gym on the Friday morning when I got a voicemail. I tried ringing back a couple of times and there was mixed communication. ‘So the next day I got my agent to ring him (Cook) and he was told the decision, so I found out that way. ‘It summed up the whole season for me really. ‘I am sure the manager had a lot of players to deal with and guess that’s just the way it happens. 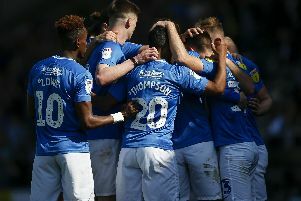 I don’t hold any grudges and still wish Pompey a successful season. Fogden was a pivotal figure in the side which clinched Football League safety under Andy Awford at the end of the 2013-14 campaign. Last summer he damaged cruciate knee ligaments before returning to play nine more times. But the midfielder is adamant he is over his injury problems. He added: ‘I came back from my knee in January and from then didn’t miss a training session and was fit for every game. ‘Then Gary (Waddock) came in for the last four games and it was a bit of a turbulent period, shall we say. ‘I had gone from the low of the injury and then the high of coming back and getting those few games, to another down period of not getting any game time. Then my contract wasn’t extended.